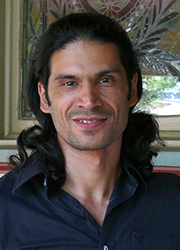 Born and raised in Afghanistan, Mahmoud Salimi earned his B.F.A in theater from Kabul University. As a Fulbright scholar, he earned his M.F.A degree in film and television from Savannah College of Art and Design. He started his film career as a screenwriter and a film director’s assistant in 2000. Since then, he has worked on various fiction and documentary films, music videos and corporate promotions in Afghanistan, Pakistan, Germany, Japan, and the United States. He has filled the roles of writer, director, producer, cinematographer, editor, production manager, gaffer, camera operator and camera assistant. His work has been recognized at the Savannah College of Art and Design, the Peace Festival, the First Cut Film Festival, the Bronze Lens Film Festival, the Lewiston Auburn Film Festival. Mr. Salimi co-founded Exile Theater when he was a refugee in Pakistan in 2000. The company produced theater plays in Asia and North America. He also cofounded The Dramatic Arts Center in Afghanistan. The organization coordinated national and international theater festivals in Afghanistan. Mr. Salimi has worked for organizations such as the United Nations, the BBC, Afghan Films Studio, Radio and Television of Afghanistan (RTA), Terre Des Homes (Tdh), and National Bureau for Sustainable Development in Afghanistan and Pakistan. He has taught various film and theater classes at the Art Institute of Jacksonville, the University of Kabul, the Irfan Cultural Center (Pakistan), and the Foundation for Young Afghan Filmmakers in Afghanistan.